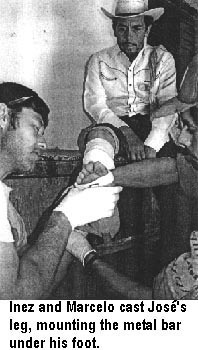 JOSÉ, who is 48 years old, was brought to PROJIMO by his concerned wife and son. Six months before, he had had a stroke (cerebral vascular accident) that paralyzed his right side. At first he could not walk or talk. Weeks later he began to walk with much difficulty, using a cane. But his speech did not return. He had trouble expressing his wishes. He got angry with his wife when she did not understand him - and she would get angry with him. She thought his inability to speak came from weakness of his mouth, and that if he could learn to move his lips and tongue better he would be able to talk. She was sure he understood everything she said to him, and was irritated that at times he didn't respond appropriately. Fortunately, when José first visited PROJIMO, Ann Hallum, a visiting physical therapist, was there facilitating a course to help up-grade the village team's knowledge and skills. CAUSES OF LANGUAGE PROBLEMS. Ann explained that, after a stroke, difficulty with speech and communication can be caused by a combination of problems, depending on the area of the brain that was injured (by stroke, illness or injury), Injury to one area of the brain's "language center" can prevent the person from understanding the spoken or written word (receptive aphasia). Damage in another language area can prevent her from recalling or forming words or phrases correctly, either in spoken or written form (expressive aphasia). Persons with severe language problems may have losses both in receiving and in expressing language (total aphasia). José's right-sided paralysis meant that his left brain (with the "language center") was damaged. Simple testing was needed to find out the causes of his difficulties with communication. TESTING JOSÉ'S UNDERSTANDING OF LANGUAGE. To test how well José could associate words with the things they represent, a PROJIMO worker, Andrés, put a number of objects - a carrot, a spoon, a tomato and a cup - in front of him. Andrés said, "Give me the carrot." José looked at the different objects a long time, then picked up the carrot. Everyone clapped and praised him. However, with the other objects he had more difficulty, and often made mistakes. When Andrés said, "Give me the tomato," José pondered a long time, then handed him the spoon. Further testing showed that although José had a lot of trouble with nouns (things), he was much better with verbs (action words). Often he would understand a noun when it was used in a phrase involving a familiar action. For example, when Andres asked him to pick his sombrero (hat) from several objects on the table, he was confused. But when Andres said, "Take off your sombrero," José gave a sigh of understanding and at once took off his hat. These findings gave clues to how his family might communicate more effectively with José. It helped his wife understand why he often did not respond appropriately to her questions; why he would grunt "Yes!" when she asked, "Do you want a cup of coffee?" and then get upset and frustrated when she brought him coffee. Sometimes, when José wanted to say something, he would repeat the word "Burro!" (donkey) many times. This used to make his wife angry. But when, during the testing, she saw his confusion with names of things, she gained more understanding of his problem. During the testing, it became clear that José had difficulty with names of things. But when his mistakes were clearly pointed out, he learned fairly quickly. When he was asked to pick up the spoon, but took the tomato, Andrés would say to him, "No, that is not a spoon, It is a tomato." After 2 or 3 repeats, José would usually pick up the spoon when asked. A PICTURE BOARD FOR BETTER COMMUNICATION. Because one of José's biggest difficulties with language was recognizing the names of things, Andrés and others sat down with José and his wife and drew up a list of the things that were most important for communication in the home. This included a variety of foods and other objects. They drew pictures of these things on sheets of paper. To make it easier, they started by drawing a single object on a sheet, and showed José one drawing at a time. They asked him to point to the thing he wanted to have or to say at that moment. After practice with this, the team made communication boards for different groups of things. One of the first boards they made was of foods. When considering which foods to include, Mari's daughter, Lluvia, insisted that a drawing of ice cream be included. Mari thought ice cream would not be one of José's priorities. "But what if he wants it?" Lluvia insisted. So, ice cream was included. When he began using the list, one of the first things José pointed to was ICE CREAM. When it was brought to him, he laughed with delight. With practice, José learned to identity most of the objects on the boards and to recognize their names when spoken. He learned to use the board to point to something he wanted, especially when he had trouble associating it with the right word. Later, to make it easier for him to carry his sheets of pictures, the team reduced and reassembled the most useful drawings into a small notebook that he could carry in his pooket. During the days that José was at PROJIMO, his wife and Andrés used both the picture boards and real objects to help him associate words with things and actions. Although progress was slow, his communication skills improved. Most important, perhaps, was that José and his wife were less frustrated with one another and began to realize that they were both doing their best. In helping José to re-learn to recognize words, it became clear that he was quick to notice and interpret gestures and signs. One day a deaf carpenter named Chon, who sometimes helps at PROJIMO, saw Andrés teaching José with the picture board. 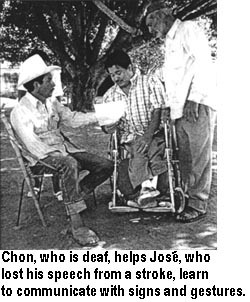 Quickly understanding José's difficulties with words, Chon began to explain things to José, using signs and gestures. (Chon's sign language was not a standardized formal system. It had been developed out of necessity, by him, his family, and the villagers since he was a child. But Chon managed to communicate and understand almost everything with remarkable clarity.) José picked up on Chon's signs very quickly. This gave José's wife new ideas for communicating with her husband. Everyone thanked Chon for his valuable assistance, and he was delighted to have been able to help with his expertise. When José first came to PROJIMO, he walked with difficulty, using a home-made cane made from a bamboo-like plant called otate. 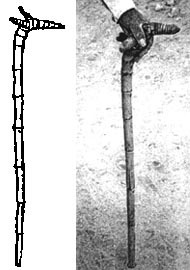 The curved top of the cane was formed by the main root of the plant. Two smaller side-roots provided additional supports for a firm grip. Improvement with Time. On testing José at PROJIMO 8 months after his stroke, the team found he had regained much of the strength in his weak leg. He was able to partially squat on that leg alone. With daily squatting exercises, the leg would probably get stronger still. Problem. José's right leg was now strong enough to let him walk fairly normally. But the habit of locking his knee backward at the start of each step was, by now, strongly fixed. Inez, a physical therapy assistant at PROJIMO, encouraged him to bend his right knee while walking. He had José practice shifting weight from one bent knee to the other while he held onto a bar. Once José understood the request, he did this willingly. But he still walked with a "back-knee." What to do? A Partial Solution. 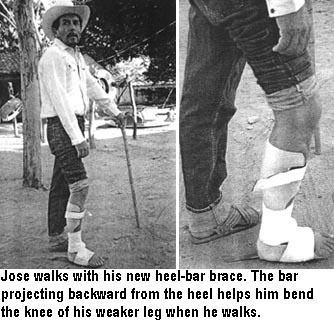 Something was needed to help José break his habit of back-kneeing and to relearn to bend his knee when stepping with his leg. The team decided to experiment with a leg-brace that would push his knee forward when he put weight on his foot. 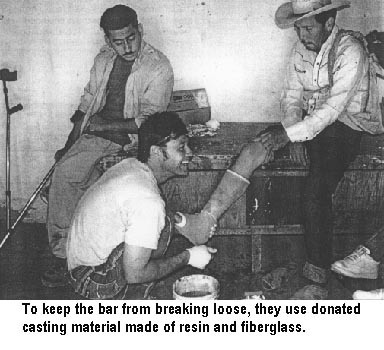 Before making the plastic brace, Inez did a trial with a plaster cast. The cast lifted the front of the foot slightly upwards, so that when the foot was flat on the ground, the knee would bend. However, this was not enough to prevent José from walking with his knee pushed back (on his heel with his toes in the air). 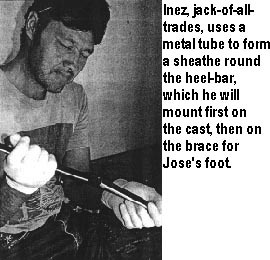 Therefore, Inez mounted a metal bar in the cast under José's foot. The bar projected backwards, behind the heel. This way, when José took a step with his right foot, the heel bar would push the foot to make it land flat on the ground. This would cause the knee to bend forward with each step. To make the heel bar removable and adjustable, Inez inserted a flat iron bar into a thin-walled metal tube. He then hammered the tube into a rectangular shape around the flat bar. The experimental cast worked fairly well. 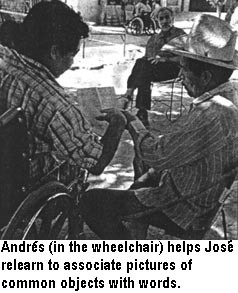 Although José felt awkward in it, he at once began to walk bending his knee, and soon he had a more normal gait. The cast had the additional advantage of correcting the foot-drop (front of the foot hangs down when the foot is lifted) which remained after his stroke... 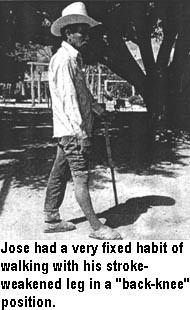 Within an hour or so of practice, José put aside his cane and began to walk with larger, more even steps. He was delighted, although still somewhat disturbed by the cast. A plastic brace with an adjustable heel bar. After demonstrating that the cast with the heel-bar helped José bend his knee while walking, Marcelo made a plastic brace in which he mounted the same bar. Because the experimental cast had bent José's knee forward only slightly - and sometimes the knee started to bend backward - when making the brace, Marcelo increased the ankle-angle so that the front of the foot was somewhat higher. José practiced with his new brace at PROJIMO for a few more days before he and his wife went home. It is still too early to know the final results. For the time being, José walks more evenly and with larger, more regular steps. The team hopes that after a few weeks (or months?) with the brace, José will become so accustomed to bending his knee when he walks, that he will continue to bend it when he no longer wears the brace. Adjustrnents. At the time of this writing, José had returned home with his brace. As he gets used to walking with his knee bent, the heel-bar can gradually be pushed deeper into the brace to make it shorter. Depending on his progress, José may soon be able to stop using the bar brace. For a while, he may need a modified shoe with the heel that sticks 2 or 3 centimeters out behind. This, too, will push his knee forward gently, though less powerfully than does the long heel bar.